Praise God!!!! I feel like it is important to begin this writing with an expression of praise towards our God. God is so faithful and mighty, just and holy!!!! How many times have we counted ourselves out, but God never once changes His mind about who and what we are. The gifts and the callings given to us as we are formed in the womb are without repentance!!! Truly a reason to remember our Savior in this season! Father, we love You. There is no one like You in all the earth. Recently, while on my way to work, I was listening to the Word of God and was reminded of how remarkable and unfailing is our God. He never strays from His plan for the lives of His people. Generation after generation, stories are the thread that keep family memories alive. Stories are vehicles that carry legacies to the next generation. Remember the way you emotionally respond when you tell of grandma’s hug? In my case it’s the stories of my relationship with my daddy. My children did not have the opportunity to meet him, yet their eyes light up and fill with wonder when I speak of him. My heart connects with theirs and we remember who we are and where we come from. In the same way, the stories of the Bible connect us to a legacy of life and open us up to hear the heart of God. That morning, the story I was listening to was the about Moses. Most of us have heard the story of Moses and how he was sent to Egypt to free the Israelites and lead them through the wilderness to their promised land. This time, as I was listening to this story, I heard something that I had never heard before. It was surely a Rhema word, a revelation that was fresh to me. God began to whisper to my soul from the very beginning of Moses’ story. Moses was comfortable minding his own business tending to his sheep when he saw a bush on fire, but it was not burning up. He was curious and in awe, so he decided to take a closer look. When he turned to investigate, God spoke to him. In this moment of curiosity, Moses encountered the living God and he would never be the same. In fact, Moses would become a friend of God. The Bible does not say that Moses knew God. He was not walking around with his hands lifted high, singing praises, paying tithe, or being a good Christian. He was comfortable and was simply strolling through life. But God saw the pain of His people … and God knew. He remembered the deposit that He had made in Moses. He remembered the promise that He gave to Abraham. He remembered that when Moses was formed in his mother’s womb, when he was drawn up out of the water, He had made a Holy Spirit deposit in him and gave him a purpose that would not be aborted. God encountered Moses on a mountain and gave him a call upon his life. Moses clearly did not want the call and he tried to escape it! But in all His majesty and authority, God said to him, “I am who I am” and sent him on his way with a call that carried an unexpected end. God is the same yesterday, today and forever. He is encountering His people today. He is remembering the deposit made and the provision given when no one could have possibly understood the depth of the call. In our own lives in this season, God is encountering His people and pouring out His Spirit on all flesh. Mothers, when you placed your hand on your womb and asked God to touch your baby, or when you cried out for salvation to come to your wayward children, God heard you. As for you and your house, you will be saved. Fathers, when you struggled to make life work and to bring the pieces together, when everything failed, God saw you. Single parents, when you struggled and thought all was lost, God was with you. Ministers, when you made the choice to serve the living God and walk away from tradition, only to have your peers shun you, God’s hand was on you. He will make you a flame of fire. If God was moved by a rebellious people, a generation of haters and whiners, He will remember you. If God encountered a man in his forties that lived his life separate from Him, He will encounter you. It never ceases to amaze me how a story can become brand new even when we have heard or read it a thousand times. God truly uses the simple things of this life to bring revelation and to provide encounter moments that shift our spiritual DNA. God told me once that this season is just a season. I initially thought, “Hmmm, not sure that I am excited about that statement.” God did not say much more. However, over time, I have learned that each season is just a season. We must learn how to embrace the season we are in and prepare for an encounter with our Heavenly Father. 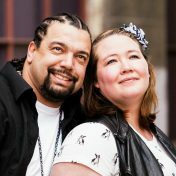 Rana Pullom and her husband, Larry, are Partners with the Healing Rooms Ministries and leaders in Blaze Ministry at the Healing Rooms headquarters in Spokane.